Below you will find a list of all the Stakes Casino bonuses - offered to new players. The right side offers a casino overview (click to scroll through the images). Stakes Casino is a great new online gambling site that welcomes Canadian players. 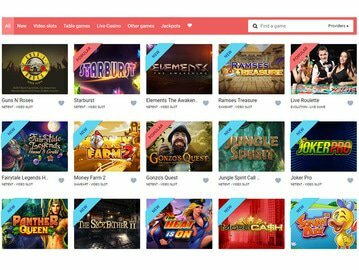 The site boasts being one of the most secure gaming places out there and with all the latest games, fantastic promotions, and quick payouts, it's easy to see why you would want to sign up today. Stakes online casino is available for both mobile and desktop gameplay so you can play anytime and anywhere. Another really great thing about this online casino is bonuses without restrictions. The site is licensed and regulated by the gambling authority of Curacao and there is plenty for players to enjoy. 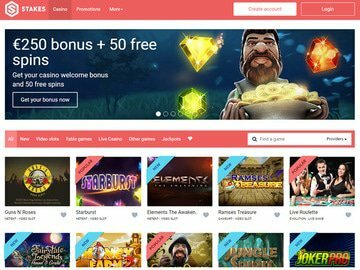 During a recent interview with the brand manager for Stakes Casino we were delighted to hear of the popularity of this gambling site with Canadian players. There are players registered from most of the Canadian provinces and some of the cities where the majority of players hail from include Toronto, Ontario, Vancouver, British Columbia, Alberta, Winnipeg, and Manitoba. There have been a lot of winners too and we expect that number to rise considerably as more and more players take advantage what this site has to offer. All players who sign up for a real money account can claim the Stakes casino bonus. There is no bonus code and the best thing about Stakes is that you can withdraw your welcome bonus winnings at any time, even if you haven't met the wagering requirements. The amount of your bonus will simply be deducted from your withdrawal. Even better, the free spins don't have any wagering requirements, meaning your winnings go right into your real money balance. The fun doesn't end with the first deposit bonus either, there are plenty of ongoing promotions for players to enjoy. Battle of the Spins is held every Wednesday and offers cash prizes for the biggest winning spins you make. This weekly challenge is divided into two categories and there is $100 up for grabs. Every Thursday players can earn up to 50 free spins just by playing the featured game of the week. Just check the site to see what the game is, make a deposit and start spinning the reels. The full details can be found on the promotions page of the casino website. Stakes casino also has a loyalty program. Players in this program get access to exclusive loyalty perks including more bonuses, more cash back, more gifts, and a dedicated account manager. Again full details can be found on the website. Stakes online casino also has a sportsbook and there is a special Sports welcome bonus worth 100% up to $100. There are also special promotions especially for sports betting fans too including the Super Winning Stakes where players can get up to 30% extra on their combined bets. You can find all the information on the website. Stakes casino uses a number of top software providers to power their casino. Players from Canada can enjoy a great range of games from Microgaming, NetEnt, Betsoft, GameArt, 1x2 Gaming, Evolution, Intervision, and RCT. The software is available in a number of different languages too including French and English. The casino is available in no download instant play using Flash and HTML5 making it compatible with all devices including mobiles and tablets. There is no dedicated app required for mobile gaming and all the latest slots and casino games can be enjoyed on iPhone, iPad, and Android devices. When it comes to casino games, the categories include, All, New, Video slots, Table Games, Live Casino, Other Games, and Jackpots. New games include the latest NetEnt slots such as When Pigs Fly, NRVNA, Theme Park: Tickets of Fortune, Electric Diva, and Football: Champions Cup. The popular games at Stakes Casino include Starburst, Koi Princess, Piggy Riches, Aloha Clutters, Twin Spin, Guns N Roses, Dragon Lady, Dead or Alive, Fruit Shop, Birds, and more. You can view the full list on the casino website. There are Microgaming, NetEnt, and Betsoft progressive jackpot slots available including Mega Moolah, Major Millions, Tiki wonders, Mr. Vegas, Icy Wonders, Slotfather, Mega Gems, and At The Copa. There are hundreds of table games to choose from too including some of the best blackjack and roulette variations as well as Baccarat Pro Series, Texas Hold'em Pro Series, Caribbean Stud Poker, and more. In the live casino section players can enjoy a selection of live dealer games including the NetEnt live casino, live baccarat, roulette, blackjack, and casino hold'em. There are plenty of banking options available for players from Canada. These include bank transfer, Neteller, Skrill, Visa, MasterCard, iDeal, PaysafeCard, Mobile Payments, Poli, Trust Pay, and more. Instadebit and eCheck are not among the list of payment options but any of the e-wallets will work just find. All deposits are instant and require a minimum of $10. All withdrawals take up to 48 hours to process and the minimum withdrawal amount is $20. Bank transfers will take longer and the minimum withdrawal is $100 if choosing this method. The main currency for Stakes casino is Euro but you can fund your account using your preferred currency such as CAD and it will be converted and added to your account. Customer support is available 24/7 via live chat and email. There is also plenty of information available on the casino website so be sure to check this out too. The support team are very friendly and are always on hand to help with any query you might have. Support is available in French and English too which is great. The casino holds an eGaming license from Curacao. Safety and security are also taken very seriously and the site is secured using SSL encryption. All the game use a random number generator that has been certified by an independent third party so players can be assured that all the games are fair. The Stakes casino bonus for new players is three-tiered, starting with 100% up to $100 plus 50 free spins. This may seem like a fairly standard welcome bonus but at Stakes, there are no wagering requirements attached to the free spins and the players can withdraw their winnings at any time. They don't have a no deposit bonus listed but with 50 free spins and no wagering requirements, we're sure you won't mind. There is no need to us a bonus code when claiming this offer either. The site itself is brand new and licensed by Curacao. The site itself is crisp and clean and can be enjoyed on all platforms including Mac, PC, and mobile. The games load very quickly and there are hundreds to choose from including the latest offerings from Microgaming and Netent. All in all, this is a great choice for Canadian players looking for somewhere new to gamble in 2016.